Syneron Medical Ltd. (NASDAQ:ELOS) was in 13 hedge funds’ portfolios at the end of the third quarter of 2016. 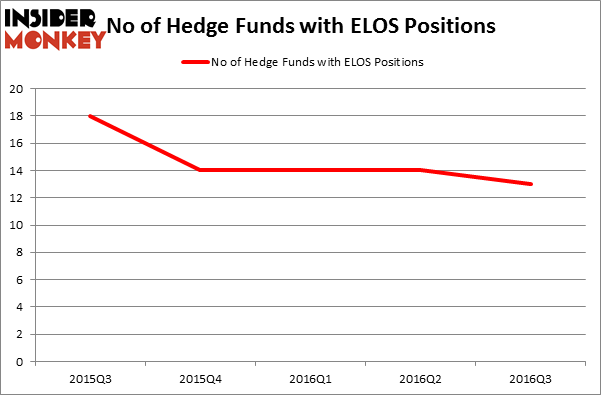 ELOS shareholders have witnessed a decrease in activity from the world’s largest hedge funds lately. There were 14 hedge funds in our database with ELOS holdings at the end of the previous quarter. At the end of this article we will also compare ELOS to other stocks including Contango Oil & Gas Company (NYSEAMEX:MCF), Scorpio Bulkers Inc (NYSE:SALT), and Franklin Covey Co. (NYSE:FC) to get a better sense of its popularity. What have hedge funds been doing with Syneron Medical Ltd. (NASDAQ:ELOS)? Heading into the fourth quarter of 2016, a total of 13 of the hedge funds tracked by Insider Monkey were long this stock, down by 7% from the previous quarter. On the other hand, there were a total of 14 hedge funds with a bullish position in ELOS at the beginning of this year. With hedgies’ capital changing hands, there exists a select group of notable hedge fund managers who were increasing their stakes significantly (or already accumulated large positions). When looking at the institutional investors followed by Insider Monkey, Richard Mashaal of Rima Senvest Management holds the largest position in Syneron Medical Ltd. (NASDAQ:ELOS) which has a $27.5 million position in the stock, comprising 2% of its 13F portfolio. The second largest stake is held by Conan Laughlin of North Tide Capital, with a $25.1 million position; the fund has 2.7% of its 13F portfolio invested in the stock. Other members of the smart money that hold long positions comprise Stephen DuBois’ Camber Capital Management, Craig A. Drill’s Craig Drill Capital, and Renaissance Technologies, one of the largest hedge funds in the world. We should note that none of these hedge funds are among our list of the 100 best performing hedge funds which is based on the performance of their 13F long positions in non-microcap stocks. Do Hedge Funds Love Sterling Bancorp (STL)? Is Super Micro Computer, Inc. (SMCI) a Good Stock to Buy? Is B2Gold Corp (BTG) A Good Stock To Buy? How Bridgepoint Education Inc (BPI) Stacks Up Against Its Peers How BOK Financial Corporation (BOKF) Stacks Up Against Its Peers Is CAE, Inc. (USA) (CAE) A Good Stock To Buy Right Now?